The KL2/CMeRIT program offers advanced training through educational activities and mentored research for senior fellows and junior faculty in clinical and translational research. The award provides two years of salary support at 50-75 percent of the awardee¿s institutional salary base within NIH guidelines. To learn more about the KL2/CMeRIT program, RFA, and eligibility requirements please see our website. David M. Guidot (Professor, DOM Pulmonary) will present a seminar sponsored by HERCULES and the graduate program in Nutrition and Health Sciences entitled: "Dietary Supplements as a Therapeutic Approach to HIV- and Alcohol-Mediated Lung Disease " on Monday, March 18th at 12pm in the School of Medicine Building, Room 170A. Snacks and coffee provided. Description: Register to attend the 2nd Annual Drs. Peter and Marlene MacLeish Endowed Lectureship lectures Wednesday March 27-Thursday March 28, 2019. This year's lecturer is Dr. Emery Brown, Ph.D., M.D., the Edward Hood Taplin Professor of Medical Engineering and Computational Neuroscience at Massachusetts Institute of Technology (MIT), the Warren M. Zapol Professor of Anesthesia at Harvard Medical School and a practicing anesthesiologist at Massachusetts General Hospital. Dr. Brown's presentation is titled, "Deciphering the Dynamics of the Unconscious Brain Under General Anesthesia." The Drs. Peter and Marlene MacLeish Endowed Lectureship Series is a Morehouse School of Medicine (MSM) event established to: recognize and celebrate the contribution of basic science, to invigorate and inspire students and junior faculty, and inform the general public about advances in biomedical science and its impact on health. The Institute for Electronics and Nanotechnology (IEN) at Georgia Tech will offer a short course on Soft Lithography for Microfluidics on April 18 & 19, 2019. This course module is designed for individuals interested in hands-on training in the fabrication of microfluidic devices using the soft lithography technique. This 2 day intensive short course will be structured to assume no prior knowledge of the technologies by the participants. The course agenda is evenly divided between laboratory hands-on sessions, including SU-8 master mold creation using photolithography and PDMS device fabrication in the IEN cleanroom, and supporting lectures. The goal for this course is to impart a basic understanding of soft lithography for microfluidic applications as practiced in academia and industry. 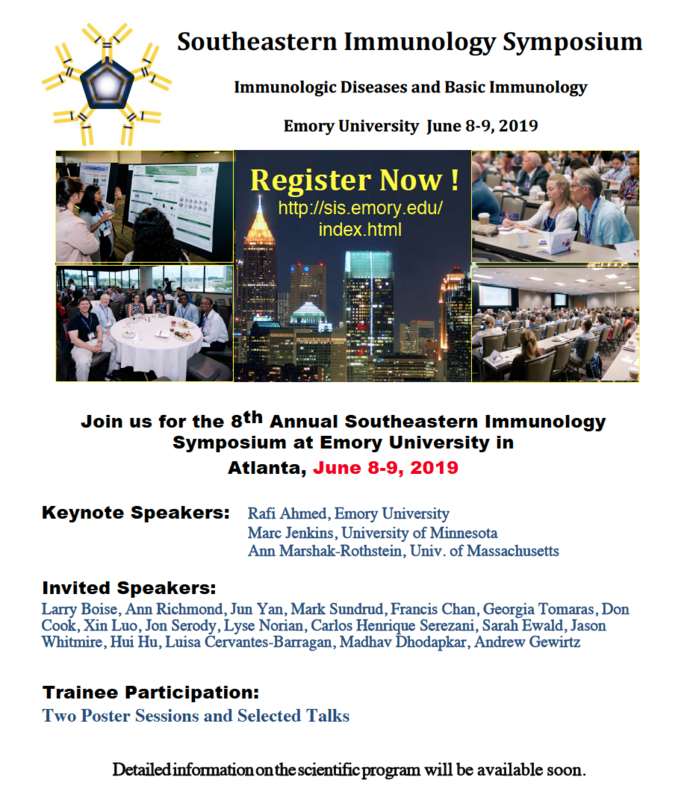 Hosted by Emory University School of Medicine, this symposium will provide a forum where the newest developments in basic, translational and clinical immunology will be shared with the goal of fostering increased relationships and collaborations. Several leading faculty from institutions across the southeast will present their work. Additionally, distinguished keynote speakers will present their most recent advances. Registration, hotel registration and abstract submission deadline May 3.